Springbank is known as Calgary's Rural community, people who live there enjoy the fine lifestyle of a vibrant community and acreage homes. On clear day’s they can see the Rockies and River Valleys for miles and miles. West of, and, adjacent to, the City of Calgary and extends for approximately 7 miles. It averages out to roughly 7 miles wide, bordered by the Bow River to the north and the Tsuu Tina Nation (Sarcee Indian Reserve) to the south. Both the Trans Canadian Highway and Lower Springbank Road North of Highway 8 connect it to Calgary. The Local government authority is the Municipal District of Rocky View and served by three schools, Elbow Valley Elementary School ( K-9) Springbank Middle School (5-8) and Springbank Community High School (9-12). This very popular high school shares a location with the Springbank Park For All Seasons which provides sports facilities including skating and curling. A private school in the area is Webber Academy, there are also many churches for worship. Links to the Catholic schools can be found on our website. At the Eastern point you will find the Springbank Hill neighbourhood. 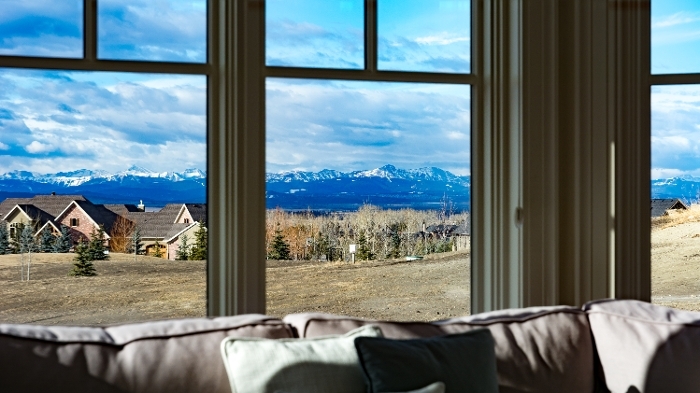 The adjacent communities of Bearspaw and Elbow Valley are smilar with their large acreage estates. Our history lessons tell us that Springbank was named after Springbank Creek which flows to the southeast into the Elbow River. The creek name was first given to the area in 1918. As long ago as 1887 it was given as a school name. Early settlers loved the area because of the springs that break out of the small coulees, and so chose to settle there. Springbank is also home to the only amusement park in Calgary Calaway Park. Golf courses: in Springbank include the Pinebrook Golf Club | Glencoe Golf and Country Club | Springbank Links Golf Course | Elbow Springs Golf Course. Springbank Airport acts as a general aviation reliever for Calgary's main airport, Calgary International, and was the 9th busiest airport in Canada by total aircraft movements in 2008. Recently, Runway 16/34 was lengthened from 3,000 to 5,000 feet to better support larger airplanes. It is also the home of the Calgary Flying Club.